How to unlock HTC Desire C by code ? Unlocking HTC Desire C by code is the easiest and fastest way to make your device network free. It doesn't interfere in your system or change it in any way so even after using our code, you don't loose your warranty. In order to receive a network unlock code for your HTC Desire C you need to provide IMEI number (15 digits unique number). It can be found by dialing *#06# as a phone number, as well as by checking in the phone settings of your device. 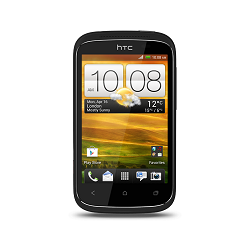 Please make sure that your HTC Desire C asks for an unlock code, when you insert a simcard from a different network. We are also proud to announce that the unlock for your HTC Desire C code will be delivered in 15 minutes, or even less. All new HTC Desire C coming from T-Mobile USA or Metro Pcs USA with "Device Unlock App" can be unlocked by a Device Unlock App service. Excellent Service. Up and running within 10 minutes. What can I say, Brilliant. Unlocking instruction for HTC Desire C ? 1. Start the device with an different simcard inserted (simcard from a different network than the one that works in your HTC Desire C). Please copy all important data from your HTC Desire C before you try a factory reset, because they will get deleted in the process. Can you unlock htc Desire C for free? You can find many free HTC code generatores for your HTC Desire C on the web. Code for HTC Desire C is based on the IMEI number. What can i say so efficient service. Just took 3 minutes to reach my order. 1000 percent reliable and would recommend to anyone wanting this service. Second time I have used this service and gain it is 5 star. Very fast and with no problems. Thank you very much indeed. Worked perfectly. Received unlock code within 30 minutes. Very fast and easy to use. Unlock details came back in minutes. Thank you very much indeed. Great service worked first time without any trouble, would use again. This worked so brilliantly. Thank you so much. Excellent service and well worth the £6 cost. Worked as advertised. Simple and effective. The code came through on the web page, not via email however. It might have been worthwhile to receive the code in an email as well. Unlocked in 5 minutes, can't get much better than that. First class service. Received code in under 5 minutes.